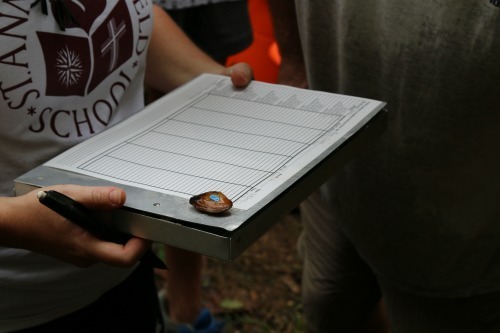 Charlottesville, Va., September 13, 2016 – Students in St. Anne’s-Belfield School’s Statistical Analysis of Environmental Field Studies course have found a site of the federally endangered species James River spinymussel (Pleurobema collina) in the White Hall area of Albemarle County. The course, taught by Bartos and Pearce Johnson, has existed for several years. In the past students have tested water at several of the seven known spinymussel sites in the state, and then compared those sites to samples of other waterways to determine if they could be working with potential sites. Last April, they believed they had a match and found spinymussels in Rocky Creek, in an area under conservation easement and so properly protected. Johnson and Bartos contacted Brian Watson, aquatic resources biologist and malacologist at the Virginia Department of Game and Inland Fisheries, who runs a program surveying this species in the state. Johnson sent photographs of mussels and dead shells that confirmed the find and also volunteered in surveys with Watson to learn the program protocols. Watson joined students in early September to set up a study site in Rocky Creek, and obtained federal and state permits so that the class could handle the species. They will now participate in a capture/recapture study in which they locate and tag spinymussels and contribute data to the state database. During this initial survey, the group found and marked 26 mussels, 14 of which were the endangered spinymussel. Watson will join the students for their October fieldwork, and then the class will continue its monitoring in the spring season and throughout the summer while simultaneously searching for new populations. St. Anne’s-Belfield School is a co-educational preschool through grade 12 day school of 900 students and 120 faculty and staff, with a boarding program in grades 9 - 12. Seventeen countries are represented in the student body, with 40% of families receiving financial aid. More information may be found at www.stab.org.